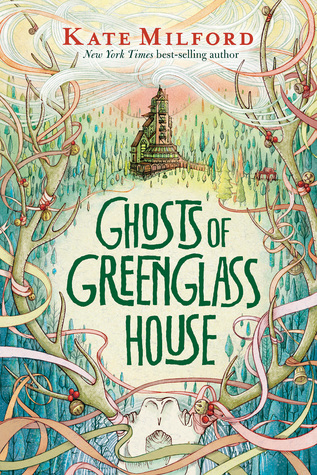 A year has passed since the events of Greenglass House and, after struggling with a teacher who singles him out for being of Chinese heritage, Milo is looking forward to a relaxing winter break at home with his parents. As Christmas approaches, however, the near-empty smugglers' inn which his parents run begins to fill up. For starters, there is Emmett Syebuck, a guest who is supposed to be leaving any time but who has stayed on to sketch just a few more of Greenglass's famous windows. Then Clem and Georgie, previous guests of the inn, show up, ostensibly for a girls' weekend, but really because they are hot on the trail of a valuable treasure belonging to legendary thief Violet Cross and they don't want Clem's fiancee to know they are once again involved in criminal activity. Finally, Milo's family receives a visit from the Waits, an odd band of carolers from nearby Liberty of Gammerbund, which many describe as an insane asylum, and through a series of unusual events, these strangers are stranded at Greenglass House. Milo is completely overwhelmed by all of these people, so he is thankful when, after a year away, his old friend Meddy shows up again and the two can resume their favorite role-playing game and work on solving a new mystery together. Despite its intimidating length, this turned out to be a wonderful follow-up to the first novel of this series and a compelling and festive story for the Christmas season. Kate Milford writes wonderfully well, and I loved getting lost with these characters in this fantastical and yet entirely believable setting. I was completely intrigued by the Waits from the moment they first arrived, and it was so enjoyable to observe each of these quirky and suspect individuals through Milo's eyes and try to figure out the motives and true backstories of each one. Milford also does a nice job of incorporating Milo's identity as a Chinese adoptee into the story without making him into a token example or a cautionary tale. She manages to highlight the problem Milo is having with his teacher without turning the teacher into a scapegoat or vilifying him as an inherently evil racist, and she makes the incidents that have made Milo so uncomfortable relatable to kids of all backgrounds by focusing them not just on race, but on the discomfort shy kids have with confronting authority figures about their feelings. I am irritated by diversity for diversity's sake - or worse, for the sake of teaching a Very Special Lesson about differences - but this storyline works really well and adds a welcome layer of depth to Milo's character and to the book as a whole. I was really disappointed when I couldn't get into last year's The Left-Handed Fate, which is tangentially connected to Greenglass House, so I was especially pleased when Ghosts of Greenglass House turned out to be such an appealing and emotionally satisfying holiday-themed mystery. Sometimes sequels just don't live up to their predecessors, but this book is definitely a worthy follow-up and one of the best middle grade novels of 2017. You have got a good set of collections for the children and that is good as it makes easy to sort them out. Well much thanks that you shared your ideas here with us.